There’s not much that’s more annoying, as a homeowner, than having a drain back up on you. After all, there’s no convenient time to drop everything and deal with a problem in your Watsonville home. That’s why, when your drains back up, you should call Rosenthal. We will take care of your drain quickly and efficiently, so you can get back to whatever you were doing. Many homeowners are tempted to try to fix their drains themselves. After all, sometimes it’s not even that hard. If you can fix your drain with a chemical solvent, go ahead and do so. You can usually purchase these at your local hardware store. Follow the instructions on the bottle. Usually, using these involves pouring some solvent down the clogged drain, waiting a specified period of time, then running water down the drain. If the solvent has done its job, your water should flow freely and your clog should be gone. If your clog persists, some people will tell you to rent a plumbing snake from your hardware store in an effort to clean out your own drain. If you want to try this, you can. We caution people against it, though, unless they have professional plumbing experience. It is easy to get the cheap hardware store snakes stuck down your drain. If that happens, you definitely have to call a plumber and the fix is usually more expensive and extensive than it would have been if you’d called before!! We can’t tell you how many times we’ve seen this happen, and how many homeowners we’ve rescued by getting the snake out of their drain! Instead of dealing with all of that hassle, call us. Our plumbers drive trucks equipped with professional plumbing snakes of all sizes. This allows them to choose the one that is the right size for your drain, making it less likely to get stuck. Our plumbers also have experience using their snakes. They know how far to feed the snake into the drain, how to maneuver around tricky curves and corners, and when it’s time to take the snake out and try a different method. When you need someone who can solve your tricky drain problem, give us a call. 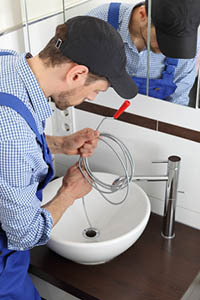 Our plumbers have top-of-the-line training and lots of experience troubleshooting tricky drains. They will be able to solve your problem because they’ve solved countless problems like it before. You can rely on them to be fast, professional, and to treat your home as if it was their own. They’ll explain all repairs to you and tell you what you can do to avoid similar problems in the future. Making a call to Rosenthal is investing in your home’s future. Whether you plan to be in Watsonville for a short time or forever, you want your home running its very best. When you call us, you know that you’re making a good decision for your home, your family, and your future.